Southern Oregon has a wealth of community opportunities that schools routinely participate in with the goal of enriching curriculum. 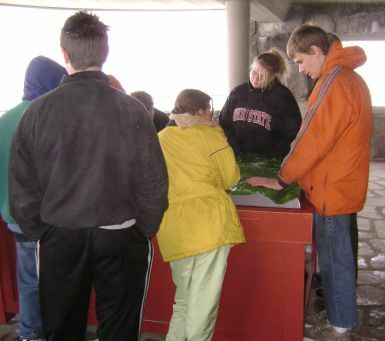 Students with sensory loss (those who are blind or have visual impairments and those who are deaf or hard of hearing) have been given this same opportunity thanks to careful planning and coordination by the Southern Oregon Regional Programs for Visually Impaired (PVI) and Deaf/Hard of Hearing (PDHH). Southern Oregon has had a long bout of winter weather, but it has not stopped students in PVI and PDHH from getting out and enjoying all that can be accessed both outdoors and indoors. As a result of a federal grant that was given to the National Parks Service, Crater Lake National Park has been conducting educational outreach to surrounding schools and programs. PVI and PDHH were selected as two of the educational groups to participate in this outreach. Students from our five county region participated in a day long fall trip to Crater Lake in October, 2007. They were provided group presentations related to water, weather, geology, and forest habitats in the unique Crater Lake area. As a follow-up, in early April, both programs will spend a second day at Crater Lake. We will snowshoe to different areas of the park under the direction of the Park Ranger and an Educational Outreach Team. Students will experience Crater Lake as it transitions from winter to spring. Our students truly enjoyed both the educational content of the fall trip as well as getting out and experiencing first-hand, the natural beauty of Crater Lake. We look forward to the spring snowshoe trip! Moving indoors, we are scheduled to spend a day in late February at Southern Oregon University in Ashland where the Theater Arts Department will be presenting a sign language interpreted presentation (for PDHH) and an audio-described presentation (for PVI) of James Thurber’s “Many Moons.” Audio description allows students with visual impairments to receive real time descriptions of action on the stage via FM headphones. The SOU Theatre Arts Department has worked with PVI and PDHH for many years to provide quality children’s theatre that is accessible. Students enjoy the opportunity to fully appreciate a live performance designed for children. In addition, the theatre group meets with our students after the performances to discuss the play and what it is like to put on such a production. Students have to opportunity to ask the performers many questions. Field trips like these give students in Southern Oregon the ability to spend time with other students with similar sensory losses. Opportunities to develop friendships and mutual support come directly from participating in regional recreational events like these. We look forward to periodically providing such opportunities that assure access, enhance learning, and build self-esteem.